Rainy days and Mondays. It seems as if we’ve had more than our fair share this fall. But I have to admit that today’s rainy afternoon wasn’t nearly as dreary as it could have been. I spent the worst of the rain showers inside The Hill School where I had the first of several parent-teacher conferences of the sixth-grade year. Understandably, Cam was a bit nervous when I bid him farewell, knowing that in a few short hours I’d be back at school not to pick him up but instead to talk about him. It turns out the conference went well compared to past meetings. Although he has some goals to focus on for the remainder of the trimester, it was nice to see how far he’s progressed in the past couple of years in a few of his more challenging subjects. 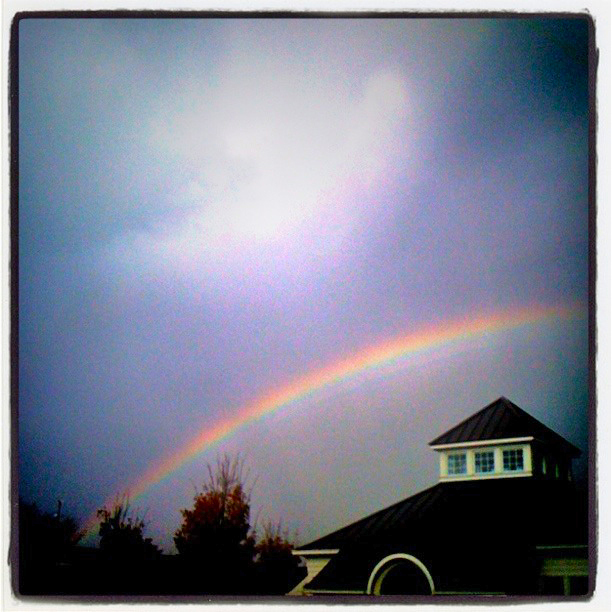 So, I would say that the rainbow that arched over the school when I picked him up this afternoon was a fitting portent of things to come: and if he does achieve his goal of the High Honor Roll this year, his pot of gold will, no doubt, be found at the nearest Apple Store. The Apple store will certainly be a nice reward !! !